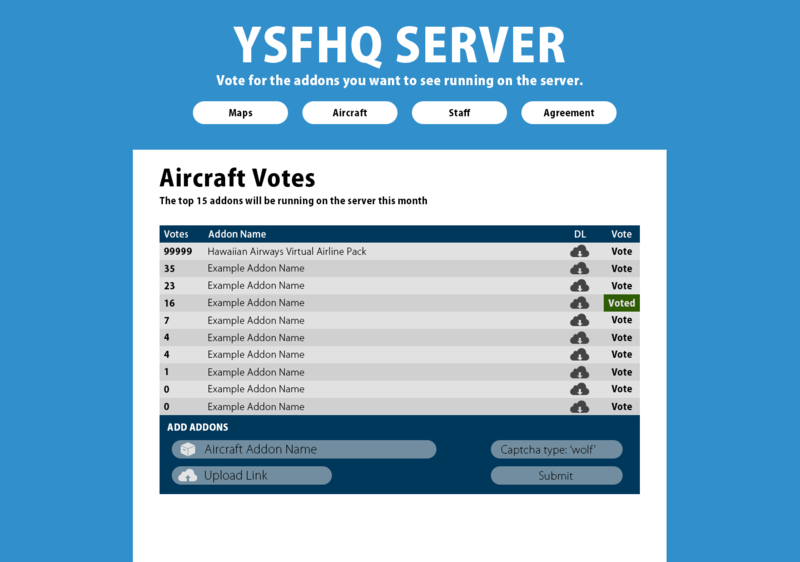 I'm going to pay someone to code this voting system so that the YSFHQ Democratic Server can go ahead (unless any of you can code it), please take a look and give any suggestions before I proceed. The new website is being built at the moment, we plan to build this in to new site, a few more weeks and it will all be up and running! Just been watching the orb video, looks like a pretty amazing project. Keep up the good work Flake! Topic: A NEW & IMPROVED YSFHQ IS COMING. ALL STAFF, READ AND REPLY. Flake if I can get you access to source code for current php script can you code it? If you PM me your teamviewer ID and password I will try and help set it up for you. *Serverlist doesn't appear to be picking it up. As part of the agreement multiple admins would be able to log into server, and of course little to no downtime would be mandatory. I will be in touch with Fariiniq and discuss at the upcoming ysfhq staff meeting. The server is back online in case you haven't noticed.